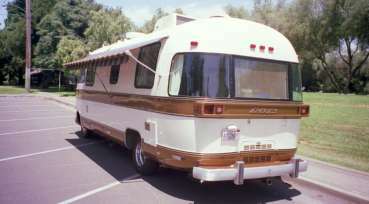 1976 Argosy 24 Exhibit "A"
1976 Airstream Argosy, This has to be the nicest Argosy in the U.S.! BRAND NEW 454 CHEVROLET (Mr. Goodwrench) FACTORY MOTOR, with 50,000 mile transferable warranty. Enhanced interior for more room and storage. All aluminum body (monocoque, like an airplane)has new paint in original colors. New carpeting and upholstery. CB radio. In the rear, between the twin beds a cabinet converts to a 4 person dining table. 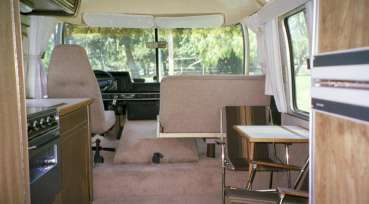 There are 180 degree wrap-around windows in the rear for a great view. Like-new Zip Dee awnings on both sides, with matching folding chairs. 4.0 Onan generator starts from inside. This aerodynamic motorhome has a high power-to-weight ratio making it a quick and easy driver in the mountains, and is very easy to park. Many more photos are available if you send an email. We are located 45 miles south of San Francisco. All maintenance records available. 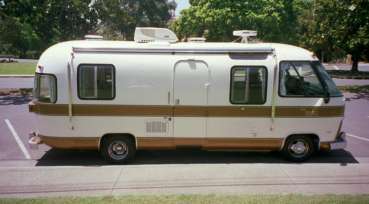 This is a rare opportunity to own a (Airstream quality) beautiful vintage motorhome with a brand new factory motor (not a rebuilt). Telephone anytime, day or night. You will not be disappointed! Delivery to your driveway is possible.